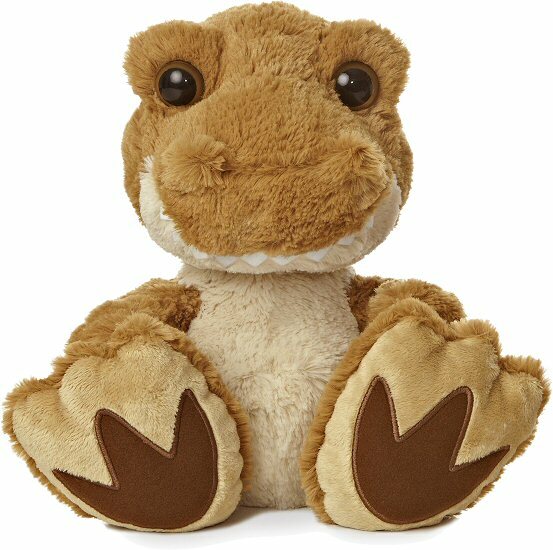 This is Roaree, an adorable T-Rex stuffed animal from the cute and cuddly Taddle Toes collection. 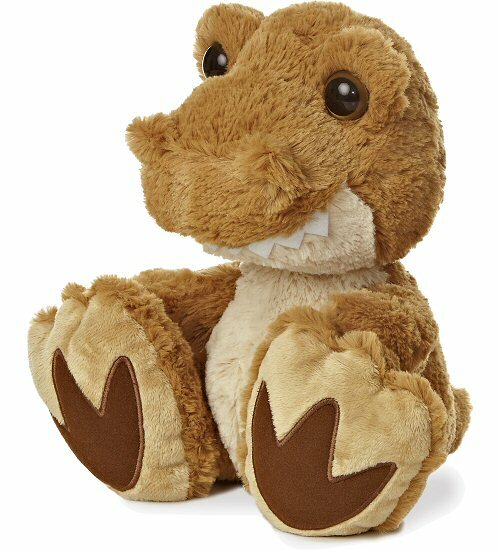 This plush Tyrannosaurus Rex has awesome oversized feet with brown "foot prints," a wonderfully huggable body, and warm golden-brown eyes. With soft golden fur, a tan tummy of the same soft fur, and a smile full of fun felt teeth, you'll love taking this delightful stuffed dinosaur on all of your imaginative adventures. Famous Fictional T-Rex Dinosaurs: Rex from Disney's Toy Story movies; Skateboarding Radical Rex from the video game of the same name; and Rex from the book We're Back: A Dinosaur's Story. Hmmm... I guess it's nice that Roaree here has a more unique name than Rex! Stuffed t-rex dinosaur T has soft bright green fur, lemon and cream accents, and big sleepy yellow eyes. This cute little T-Rex dinosaur stuffed animal keychain has soft red fur, an orange tummy, and fun felt teeth. Add a huge splash of jurassic excitement to your child's room with this repositionable T-Rex Dinosaur giant wall decal. This adorable Tyrannosaurus Rex Dinosaur fabric wall art is a wonderful addition to any dinosaur fan's room. Toughie Triceratops plush animal has a wonderfully huggable body of soft blue fur and three perky horns.